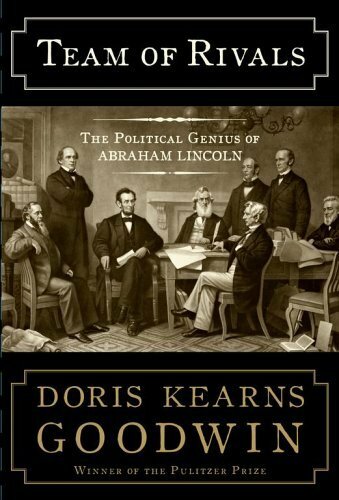 If your wardrobe includes a significant amount of tweed (denoting a serious student of history) or a scratchy wool suit, either blue or gray, circa 1864 (denoting the true Civil War buff), then Doris Kearns Goodwin has published just the book for you. Team of Rivals tells the political story of the Civil War; its thesis, which is well argued throughout the tome, states that Abraham Lincoln was not the podunk rail splitter whose destiny was determined by chance, a decent man who happened to be in the right place at the right time. Instead, Goodwin argues that Lincoln masterfully pulled the strings of the entire Republican party in order to receive the nomination in 1860, and then he Lincoln's magnanimity allowed him to forgive his rivals/enemies, many of whose condescending words truly warranted not just a cold shoulder but pistols at dawn. Goodwin has made a significant contribution to the already voluminous collection of Lincoln and Civil War studies. Impeccably researched, there are near 150 pages of notes, referring often to previously unknown primary resources. Though many will buy this monstrosity of a book because of all the buzz, the truth is, few will finish. Goodwin is no David McCullough; she is not a storyteller. She is an historian, and her writing is often stilted and overwhelming to the reader, two of the traditional hallmarks of historical writing. One last complaint. Goodwin dedicates too much time and too much ink to her favorite tangents: Kate Chase and Mary Todd Lincoln. She could have significantly slimmed down this tome by removing the repetitious accounts of the Washington social scene during the war. Instead, Goodwin could have made a second contribution to the literature by writing a book on Kate Chase, Mary Todd Lincoln, and the women of the Civil War.